Swish your way to a P10,000 shopping spree at Forever 21! I’m not that big on mouthwash because the stuff tastes awful. You know it’s true! Maybe it’s just me but using most mouthwashes these days is equivalent to mild torture - it stings your mouth and leaves it with a burning sensation for a while after you spit it out. That’s not really something I want to subject myself to on a regular basis. I do however still use mouthwash every now and then, particularly when I want my breath to be fresher for a few more hours. It’s really useful when I’m going to a meeting or an event where I need to be at my most confident. Still, I know, I know, we should all use mouthwash everyday. It goes beyond giving us fresh breath - it also helps with preventing plaque build-up and tooth decay. It’s just one of those unpleasant things you have to live with I guess...but not really. It seems that I’m not the only one with ~issues~ so Swish swooped down to solve the problem! 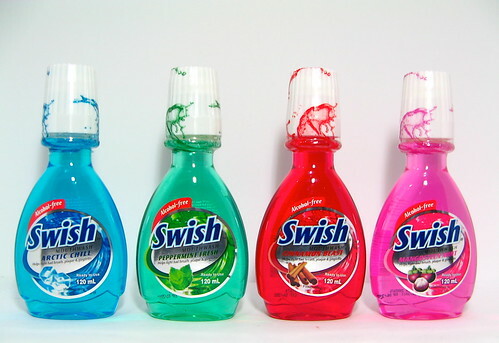 There are three neat things that sets Swish apart from other mouthwashes that I’ve tried before. 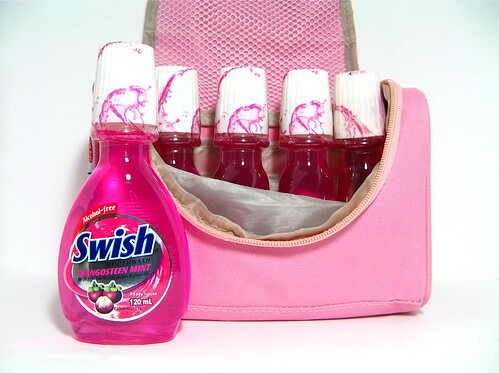 Swish is super fun to gargle, so I can actually swish it around for a good 30 seconds (and more!) without wanting to throw it up. It’s because these mouthwashes don’t have any alcohol content. It has cute flavors! How many mouthwashes do you know has cinnamon and mangosteen flavors? Huh? Huh? That totally blew my mind. The bacteria-killing action is noticeable in the sense that even though it’s been hours and I’ve already eaten, my breath doesn’t turn bad. So there. I have quite a few Swish bottles here that I’ll probably use up. My favorite flavor is Mangosteen Mint because it’s the sweetest out of the bunch and it’s an unforgiving shade of pink. Win win. 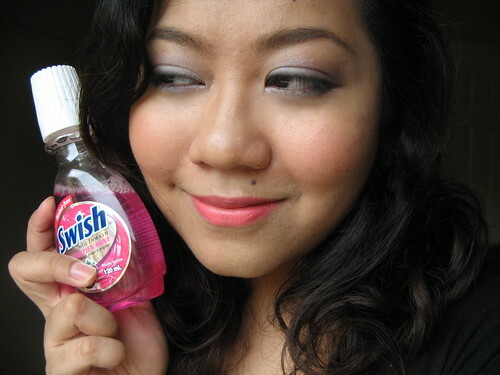 Speaking of win-win situations, I’d like to announce an awesome contest courtesy of Swish! The winner gets a P10,000 shopping spree at Forever 21! It’s super easy to join. 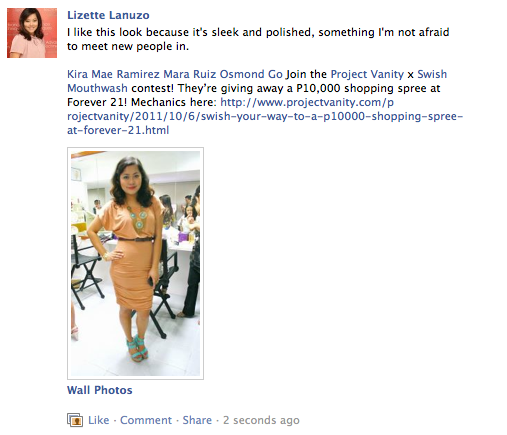 On the Project Vanity Facebook Page, post a photo of yourself wearing a look where you feel most confident. By look, I mean head-to-toe - from your hair, to makeup, to the clothes and shoes you’re wearing. I want to see you in a full outfit that makes you feel like you’re on top of the world, ready to Swish your way to success! With the photo, write a short description of why you chose that particular look. Tag Swish and three (or more friends) in your entry. Your entry should look like this (tagging is A MUST). *Please share the link of your entry in the comments below so I know you joined! Like the Swish Facebook Page (we will check) and of course Project Vanity. [OPTIONAL] Follow my updates on Twitter - @lizlan - and Tweet this contest! You don't have to do this but it's just plus points in my book. All valid entries will be judged by the following criteria: 50% Overall awesomeness of your look, 20% Quality of photo, 30% Eloquence of photo description. Contest ends on October 27 November 4. The best entry as judged by Project Vanity and Swish will win. Winner MUST be able to claim the prize at the Nuffnang Office in Bonifacio Global City at a specified date. You can join if you’re based in the province or even abroad, but you must be able to travel to Manila, of course bringing your valid ID. Proxies not allowed. Hi everyone! I decided to extend the contest due to last minute entries. :) I want to give more people a chance to join. So, please send in your entry by November 4, which will be the final deadline. I so love this look because I was able to create a sophisticated vibe by combining three different textured pieces - leather jacket, knitted top and semi-sheer skirt. To make the look perfect, I wore black pumps, pearls and black satchel as my accessories. However, instead of the typical trend of being the polished, corporate chic, I went for something a little bit more casual and young by deciding to have a texture play, particularly the biker jacket added on. I really had fun styling my look and it's all because of the confidence I bleed for every look I'm channeling. Well the thing here is, if you've got CONFIDENCE, you'll definitely SWISH your way to reaching your goals! Congratulations, Bettina! I will message you on Facebook re how you can claim your prize. To everyone who joined, thank you, and here's to hoping for more bongga contests in the future!